ontop-quality, long-life bearings from our own factories. optimum temperature levels throughout the unit. to making our compressor unit a market leader. and even close to offices. Constant light: operational phase, alarms and emergencies. 1) INTAKE FILTER built specifically to intercept any solid particles in the surrounding air. 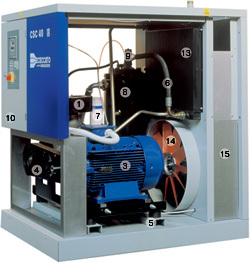 2) COMPRESSOR high efficiency rotary screw compressor for great reliability. 3) ELECTRIC MOTOR three-phase asynchronous electric motor, class F according to CEI EN 60034-1. 4) BELT DRIVE TRANSMISSION high performance selfventilating V-belt drive. 5) ANTI-VIBRATION MOUNTINGS motor/compressor unit is mounted on anti-vibration mountings isolating moving parts from rest of machine. 6) TUBING all machine parts are interconnected using flexible tubes or hoses with leak-proof seals that absorb vibrations generated by moving parts. 7) OIL FILTER screw-on cartridge oil filter that is easily removed for maintenance. 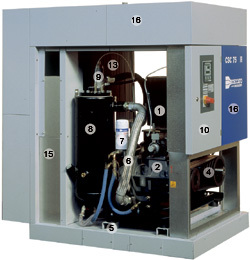 8) AIR-OIL-SEPARATOR a high-efficiency multi-stage air-oil separator with low power loss while removing compressor lubricant from compressed air stream. 9) MINIMUM PRESSURE VALVE a non-return valve to ensure correct oil flow from early phases of start-up to idling periods. 10) MAIN CONTROL BOARD housed in shock-resistant, airtight container in 12/10 sheet steel, the main control board has first-class reliable electrical components tested under the toughest possible operational conditions. 11) ES 3000 CONTROLLER the ES 3000 controller is an efficient automatic compressor regulation system for continuous monitoring of the entire compressor unit. 12) MAIN INTERRUPTER SWITCH with door interlock and load-triggered emergency release facility. 13) AIR-OIL AFTERCOOLER a package-type aftercooler with large surface area available for heat transfer maintains low discharge air temperature and keeps circulating oil at optimum temperature. 14) VENTILATOR turbo-charged ventilation ensures correct air flow even in the toughest operating conditions. 15) NOISE-REDUCTION PANELS placed at cooling air inlets and outlets absorb noise and reduce any noise filtering. 16) SOUND COVER soundproof compressor cover in sheet steel, painted and covered with sound absorbent and fireproof material, with openings to allow airflow of cooling air both in and out. Air intake opening with easily removable panel filter for prefiltering of ambient air.